1) I love playing Football Manager – I’ve been playing the series ever since CM 99/00 – but as the game’s gotten more sophisticated I’ve found it harder to keep on top of all the data it throws at you, particularly as I have less time to play it than I used to. Specifically, I’ve found it tough to quickly assimilate all the information on an opponent’s strengths and weaknesses so that I can tweak my tactics accordingly, as it sits across multiple screens in the game. 2) I’m pretty happy with my team rating system for the EFL, but the lack of freely-available data limits how effectively you can analyse each team. Player data in particular is limited as you drop down the leagues, making it hard to get a sense of how a team plays without watching them extensively. As I’m trying to cover 72 clubs at a minimum, that’s not an option. The second problem doesn’t exist in Football Manager thanks to its huge database – buying the game basically gives you access to a meticulously-researched scouting tool at a very low price. I thought that if I could come up with a simple, compact way to visualise the in-game stats, then I could use it to analyse real matches and – if I did a good job of it – it might even be considered as an additional in-game feature. At this point I have to say a big thanks to Dean Gripton and Tom Davidson from SI Games, who gave up their time to help and advise me after I approached them with the idea. I’ve pulled out the stats from the Football Manager database for every player at the World Cup, mapping it against the squad information from Wikipedia. Getting correct formations and line-ups will be tricky, but the long-term plan is that this tool can be run quickly once the starting line-ups for a match are announced. The main piece of analytical work I’ve had to do is to simplify Football Manager’s granular attributes into some simpler combined scores for ease of presentation. I’ll almost certainly tweak or add to these as I go along, but I’ve got a decent pool of them to be starting out with. So it looks like Russia are definitely better than the Saudis overall – Al-Shahrani the left back appears to be the one to watch for the underdogs, but he’s up against Fernandes – one of Russia’s better players – on his flank. Smolov looks likeliest to make something happen for the hosts. 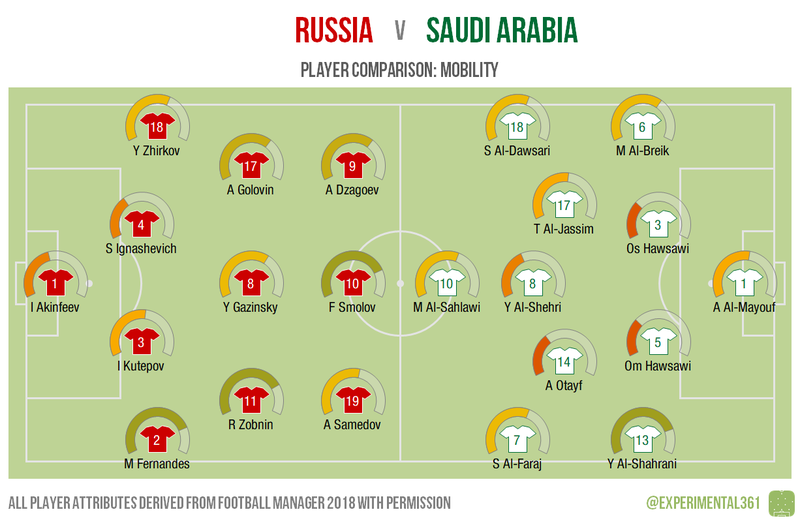 Al-Shahrani seems to be bringing a lot of movement to the side and may well have to bail out his more lugubrious team-mates in central defence if the mobile Smolov starts darting around, particularly in combination with the other players on Russia’s right flank. For Russia it looks like Dzagoev has the most guile, while the Saudis will probably rely on Al-Shehri behind the lone striker to make things happen. 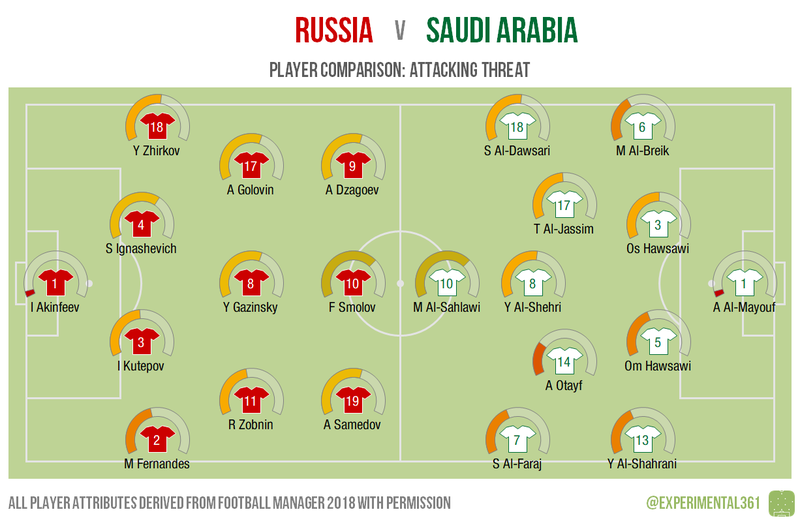 The game doesn’t think much of the Saudis’ general nous by the looks of things, although they look pretty streetwise in the centre of the pitch. For the Russians, Ignashevich looks capable of organising the defence as perhaps the savviest player in either line-up. Unsurprisingly, both sides’ central strikers are their most reliable goal threat, but Russia look to have more options overall. The Saudi centre-backs should certainly be watched at set pieces however. There are more categories available than I’ve shown here, but I wanted to get a quick “version 1” out of the door before the first match of the tournament before refining it down the line.